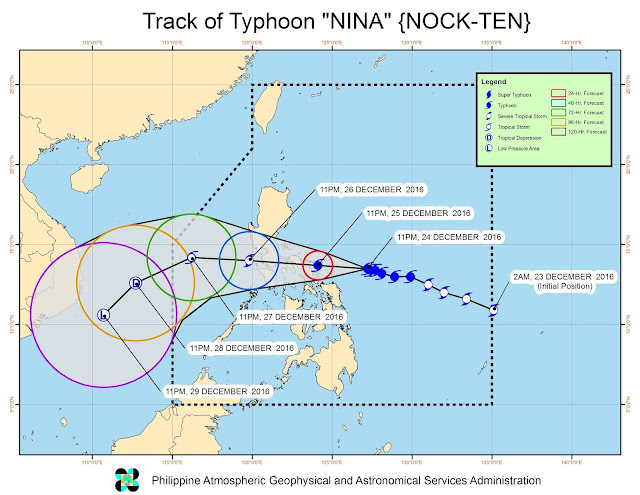 Philippines – Typhoon Nina or Nock-Ten intensify further as it reaches the province of Catanduanes, public storm warning signals already raised in some provinces that will be directly affected by the said typhoon. According to local weather bureau Philippine Atmospheric, Geophysical and Astronomical Services Administration (PAGASA) in its 5:00 AM, 25 December 2016 weather bulletin, the typhoon was located at 250 km East of Virac, Catanduanes (13.6 °N, 126.5 °E). The typhoon carries a Maximum sustained winds of 175 kph near the center and gustiness of up to 215 kph and moving west at 15 kph. The forecast track of PAGASA said that the typhoon will travel the provinces of Catanduanes after making a landfall around Sunday (Dec. 25) afternoon or evening, the typhoon will also cross the Calabarzon area and Camarines Provinces. Manila and other provinces in the area around within the 500 km diameter of the typhoon is expected to experience moderate to heavy rainfalls. The public must be prepare and be aware of the incoming typhoon despite having a good weather as of today "Christmas Day". 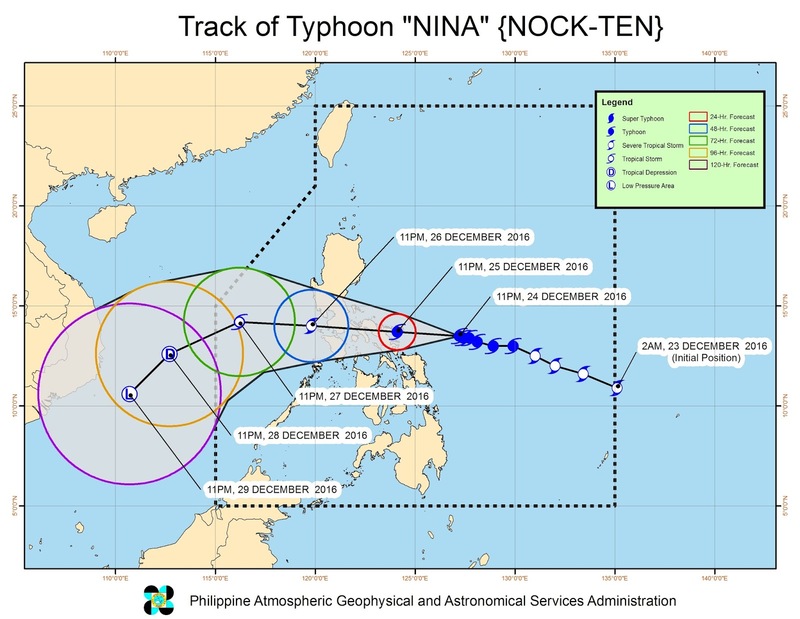 No Comment to " PAGASA Weather Bureau Raises Storm Signals of “Typhoon NINA” "